I have reviewed several of their products to date and non have disappointed, unlike some brands that I sometimes have a "love hate" relationship with. 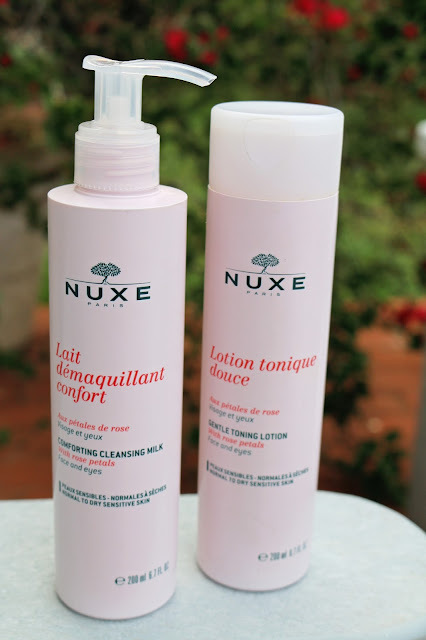 To read my previous reviews on NUXE products click on the Pink Links at the end of this post. "high end" budget and the "lower end" of the more expensive French ranges available here. 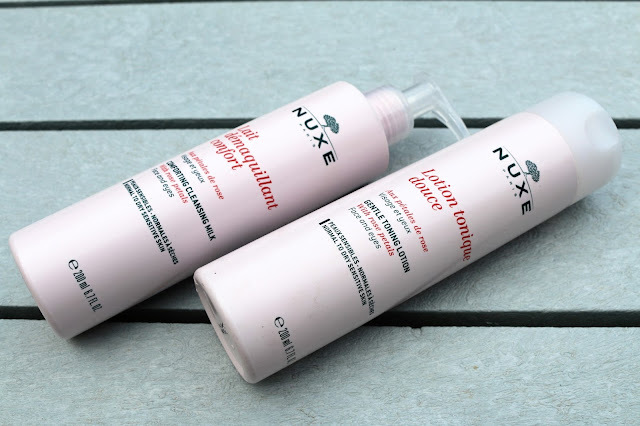 I've been on a mission over the past year or so to bring you reviews on a variety of affordable drugstore cleansing milks and toners, all in an attempt to save money without comprising quality and having found some cleansing and toning "gems", I recently opted to up the cleansing stakes a little and purchased the NUXE Comforting Cleansing Milk and the NUXE Gentle Toning Lotion both with Rose Petals. This paraben free duo is formulated for sensitive or normal to dry skins and was perfect choice for "moi". Admittedly I was drawn firstly to the soft pink packaging, then the handy pump dispenser on the cleanser, which I wished more cleansers came with and then the mention of Rose Petals and I was "sold" before I had even tried the products. Besides having a delicate rose fragrance the cleansing milk, whilst feeling gentle on my skin, had a rich velvety feel that very effectively removed make-up and impurities and left my skin feeling comforted, soft and perfectly cleansed. Macadamia Oil is the key ingredient along with Damascena Rose flower water and Allantoin and these contribute to the 94.1% of ingredients that are derived from natural origin. It can be used morning and evening all over the face, eyes and neck and can also be used to remove eye make-up, but I prefer to use a dedicated eye make-up remover as I didn't find it effective or speedy enough. I enjoyed the luxurious softness and the comfort my skin felt after using this cleanser, which is often lacking in the cheaper options. The Gentle Toning Lotion perfectly compliments the cleansing milk and as you would expect it leaves the skin feeling refreshed, soothed and soft. Its alcohol and paraben free formula is also made up of 97.4% of natural origin ingredients. This toner also works well to soothe and decongest, when a soaked cotton pad is placed over the eye area. In between reviewing other cleansers and toners for my blog this cleansing and toning duo will without a doubt be my "go-to", especially as my previous favourite duo from the French brand Yves Rocher has been discontinued here in South Africa. My sample jar is literally overflowing and this weeks product was only recently added. 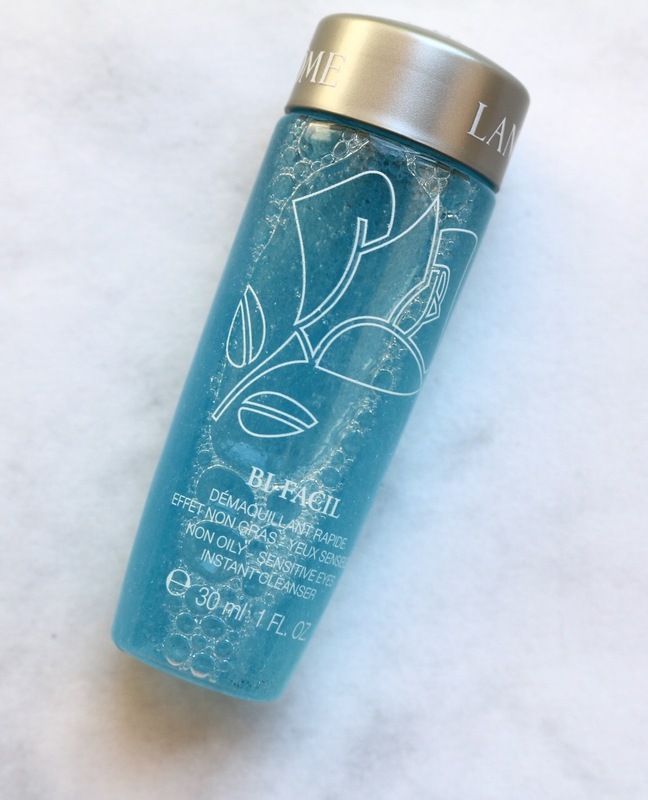 The Lancôme Bi-Facil Make-Up Remover was part of a GWP and is a generous 30ml bottle and should last me far longer than a week. Many, many years ago my daily eye make-up remover was the Effacil lotion, which I think has been around for more than 30 years that I'm aware of, and was hugely popular despite being one of the more expensive removers at that time. I remained loyal for several years and if I remember correctly Lancôme used to have an Effacil Gel also, which I remember enjoying. All of these came out of the 2016 Essence Beauty Advent Calendar. 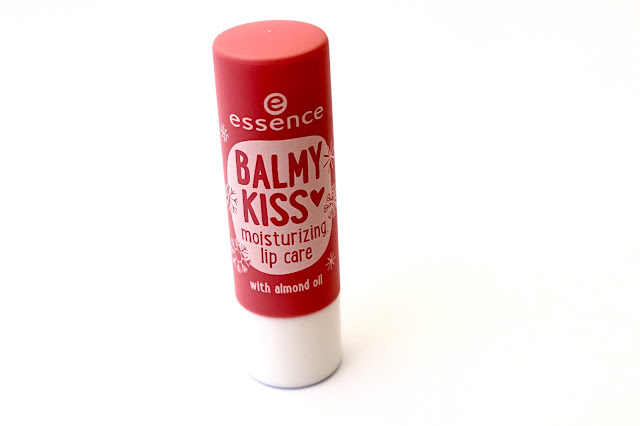 Essence is a budget pharmacy/drug store range. Needs several coats to achieve the true colour. Dries quickly and lasts several days before chips appear and even then the chips are not too noticeable. Easy lovely colour to wear and is very forgiving with painting errors. Its been one of my "Go To" Summer shades. I was pleasantly surprised with this moisturising Lip Balm. Creamy and comforting on the lips. Pale pink frosted colour, which can be applied over another lip colour. Mascaras are very much a personal and sometimes "hit or miss" affair, but this has to be one of the worst mascaras that I have ever tried. The brush is way too large for my shorter lashes. Very difficult to coat the lashes and when I did it just smudged everywhere. This mascara is perhaps more suitable for longer lashes that are requiring more volume and don't mind the fibres. If you have the straightest of lashes or reach for those eyelash curlers every morning then read on, as this post could be of great interest to you and your lashes. yes unfortunately as we age our lashes become more sparse, take longer to grow and become lighter in colour and I can lay claim to all of the above age related challenges, as I find myself using more mascara in an attempt to colour, lengthen and lift my lashes, which in turn can lead to damage or even premature lash shedding. LVL Enhance Treatment my lashes jumped at the chance, as it was perfect timing. 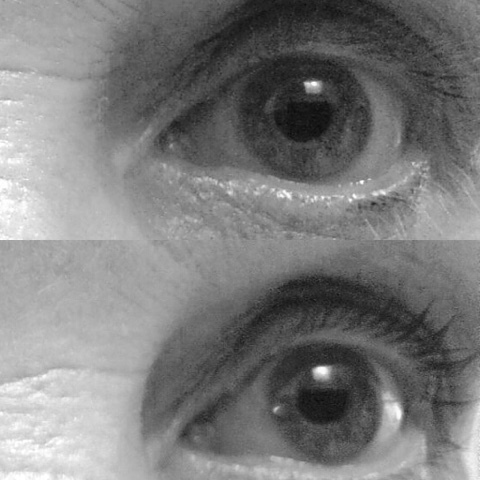 Having heard of the LVL Enhance Treatment (Lashlift) from overseas and having only read good reports, I was excited yet a little apprehensive about the treatment even though its been tried and tested in the UK since 2005. Enhance LVL treatment entails working on your natural lash and it Lifts,Volumises and Lengthens (LVL) and ultimately enhances your natural lash. but also short and fair. The treatment involves lifting rather than curling the lash and usually incorporates a tint. Together with the lift which lengthens the lashes, this creates the fabulous illusion of longer thicker lashes. The treatment takes about 45 minutes and it lasts for up to 6 – 8 weeks. Upon arrival at Nouvelle Venu salon, my appointment was handled very professionally by Yadsha and Angelique and that all important client record card was filled out and a patch test was done on my arm prior to check that I was not allergic or sensitive to any of the processing products that would be used during the treatment. Basically the lashes are cleaned and prepared followed by a protection shield being placed below the eyelashes for protection and a gel shield above the lash line. The size of the shields determine the level of lift and there are three options to choose from: most dramatic (small shield), average (medium) and least dramatic (large) and I opted for the medium. At this point I must make mention that during the 45 minute process, you will need to lie still and not open your eyes, which maybe difficult for some, I know it was for me. Lifting Balm which breaks down the bonds of the lashes, enabling them to be restructured into a new shape. Volumising Fix is then applied and this repairs the broken bonds to fix and secure the lashes into their new shape. Gel Lash Tint is applied to tint your new found lifted, volumised and lengthened lashes. Moisturising Serum is the final stage and nourishes the lashes. you basically feel the sensations of the lashes being combed and the products being applied but I hadn't a clue what the application process looked like. Below is a great video that will help you to understand the process of the LVL Enhance Treatment better. There are some simple maintenance instructions given to you on the care of your lashes. 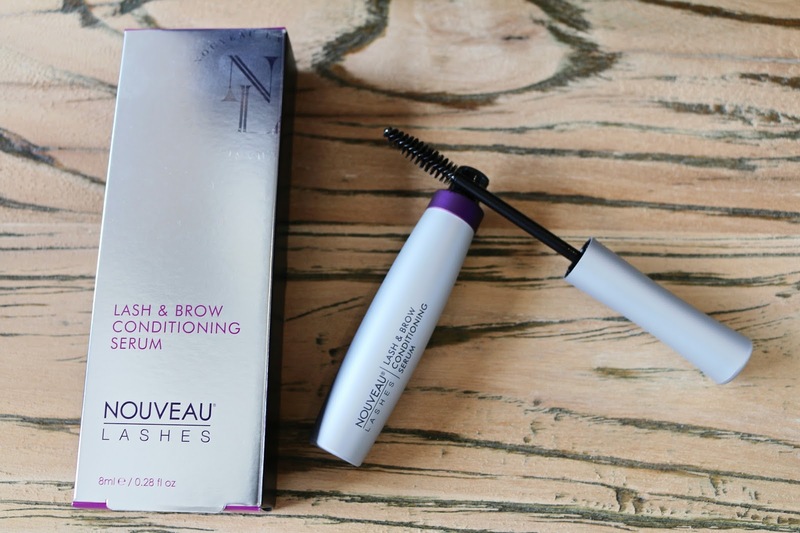 However they do recommend using the Nouveau Lashes Conditioning Serum at home to help nourish and strengthen lashes and keep them looking healthy. Ultimately, this means you can enjoy the effects of your LVL Enhance treatment for longer. I did have a very similar product, but if you don't have at home then its advisable to buy one. Knowing that my lashes were not the best to work with, I was blown away with results. 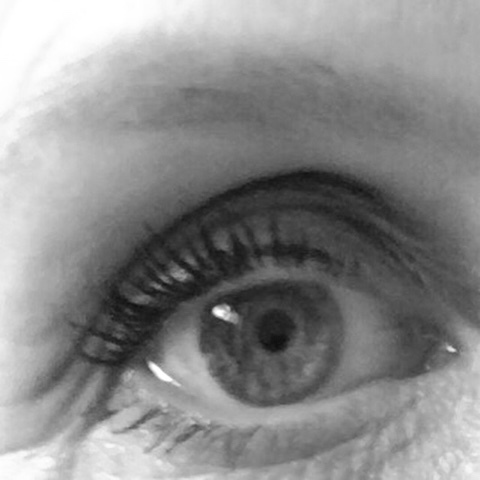 LVL lash lift not only seemed to find lashes that I didn't know I had, but they looked fuller and the lift of my lashes opened up my eye area. This treatment is perfect for anyone who has great difficulty in achieving any kind of curl in their lashes or like me... just needs to make the most of the little they have. Perfect for your summer hols or for that special occasion, LVL Enhance Treatment is a great alternative to lash extensions or false eyelashes which LVL do have a range of if the LVL Enhance is not for you. Please excuse these before and after photos but it's not so easy or pretty taking close up pics of the eye area, but you can notice an improved difference.